This evening will begin with a 30-minute guided meditation at 6:50 p.m., followed by a dharma talk and discussion at 7:30 p.m., and book signing and tea time at 8:30 p.m. The custom of dana (generosity) is fundamental to Buddhist practice. All dana received supports our Teachers and center, and is essential for the continuation of our community and practice. Through monetary dana, we suggest a $10 donation – which is neither a ceiling or floor amount. No one is turned away for lack of funds. Spring Washam is a well-known meditation and dharma teacher based in Oakland, California. She is a founding member and core teacher at the East Bay Meditation Center located in downtown Oakland. 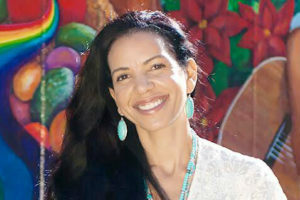 She is the founder of Lotus Vine Journeys an organization that blends indigenous healing practices with Buddhist wisdom. In addition to being a teacher she is also a healer, facilitator, spiritual activist and writer. Her new book entitled, A Fierce Heart: Finding Strength, Courage, and Wisdom in Any Moment, is available everywhere. She has studied numerous meditation practices and Buddhist philosophy since 1997. She has practiced and studied under some of the most preeminent meditation masters in both the Theravada and Tibetan schools of Buddhism. She has studied indigenous healing practices and works with student individually from around the world. She has completed a six-year teacher-training program under the guidance of Jack Kornfield and is now on the teacher’s council at Spirit Rock Meditation Center in Woodacre, California. Spring is considered a pioneer in bringing mindfulness based healing practices into diverse communities and is committed to enriching the lives of disenfranchised people everywhere. She currently travels and teaches workshops, classes and retreats worldwide.